Where can Portsmouth fans watch the FA Cup draw? What time does it start? 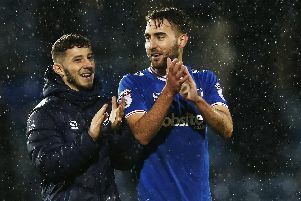 Pompey reached the second round of the FA Cup after overcoming National League outfit Maidenhead United on Saturday. Ben Thompson netted his first Blues goal, while Oli Hawkins, Jamal Lowe and substitute David Wheeler also struck in the 4-0 triumph at York Road. Attentions now turn to the draw for the second round, which takes place live this evening on BBC Two at 7pm. The draw will come live from The Beveree, home of National League South side Hampton & Richmond, ahead of their first-round tie with Oldham Athletic - which is being broadcast live on the same channel afterwards. Conducting the draw will be former Middlesbrough, Chelsea and Fulham goalkeeper Mark Schwarzer and Brighton & Hove Albion striker Glenn Murray. League One leaders Pompey are the highest-ranked team currently in the competition, following their victory over non-league Maidenhead. Sunderland, Peterborough United, Barnsley, Luton Town and Blues - the current the top five in League One - are all safely through and in tonight’s draw. Southport, who are 21st in National League North, are the lowest ranked team left in the competition. The Blues are ball number 39 in tonight's draw. Premier League and Championship teams enter at the third-round stage.